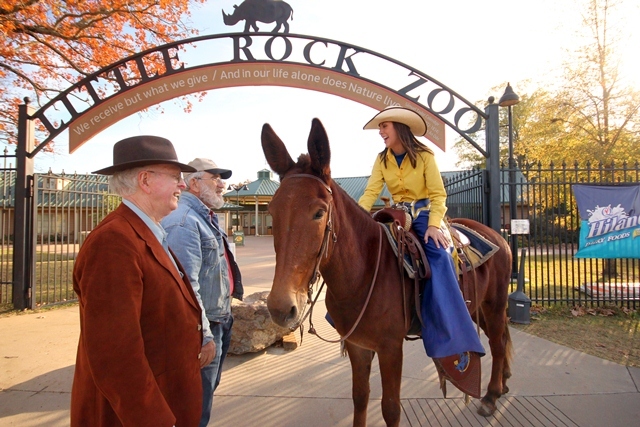 The Mulerider recently turned a lot of heads as she rode Molly Ann the mule to some of the state’s most popular locations in celebration of SAU’s record fall enrollment. 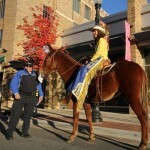 Broadway caught up to the Mulerider early November 14 at the North Shore River Walk. 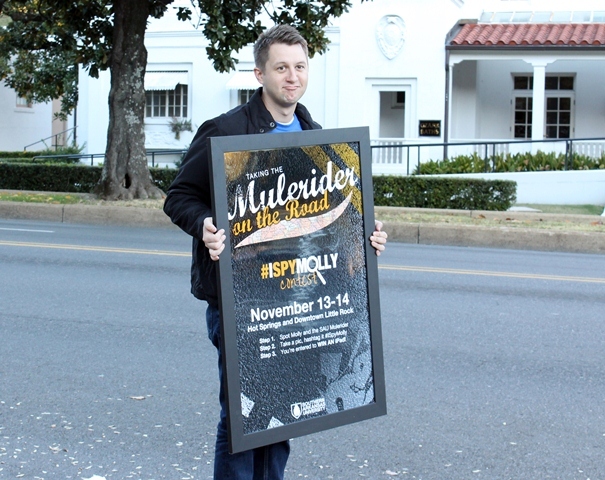 He and Brandi Hinkle, ADHE communications coordinator, posed for a photo with the Mulerider and posted it online for the #ISpyMolly social media contest. 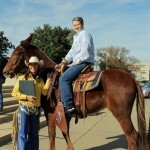 The winner of the new iPad from the contest was John Laman III, 16, of Little Rock. 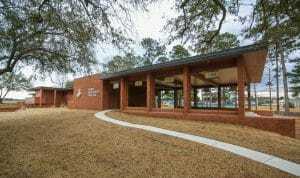 Laman said that he was on a lunch break from eStem Public Charter High School when he spied Molly at the River Market. His “selfie” was drawn randomly from the hashtagged images posted on Facebook, Twitter and Instagram. 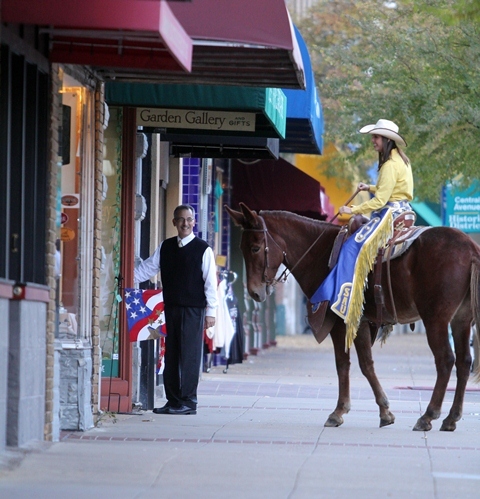 Broadway and Laman both have brief cameo appearances in the film that was produced during the “Taking the Mulerider on the Road” trip. 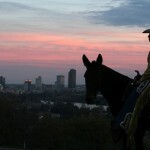 The video was created by SAU’s award-winning video production crew, which hopes this production will radiate similarly to last fall’s “Mulerider Style” video. 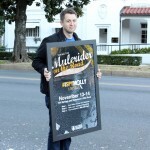 “Mulerider Style” earned Best of Show honors from the Service Industry Advertising Awards in 2012, and has been viewed almost 50,000 times online. 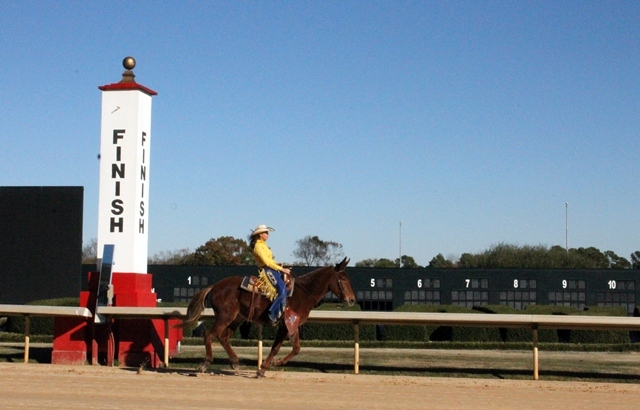 Street said that once his office had confirmed that Oaklawn was on board with the Mulerider’s stop at their racetrack, the other locations just started falling into place. 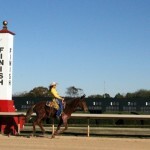 He said that it helped to e-mail a link to the Texarkana video when asking permission for SAU’s Mulerider to be able to ride and be photographed at some of the prospective locations. Also while in Hot Springs, the video crew staged a scene at the Arkansas School for Mathematics, Sciences and the Arts. ASMSA senior Justin Flynn, of Hardy, Ark., volunteered for the lead role in the scene. His performance warrants consideration of a career in acting. Flynn gets distracted by the Mulerider while playing kick ball, and during his waywardness the ball returns to hit him square in the face. 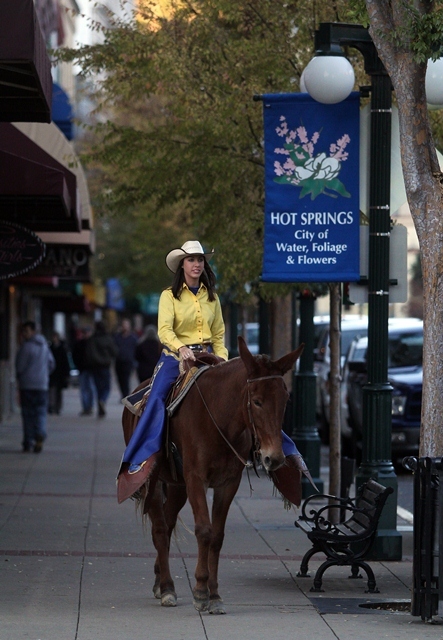 The Mulerider rides away to her next location, but does leave Flynn an SAU T-shirt and some recruiting publications. 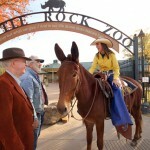 Little Rock Police Officer Shelley Griesemer also provided a standout debut performance in the film. 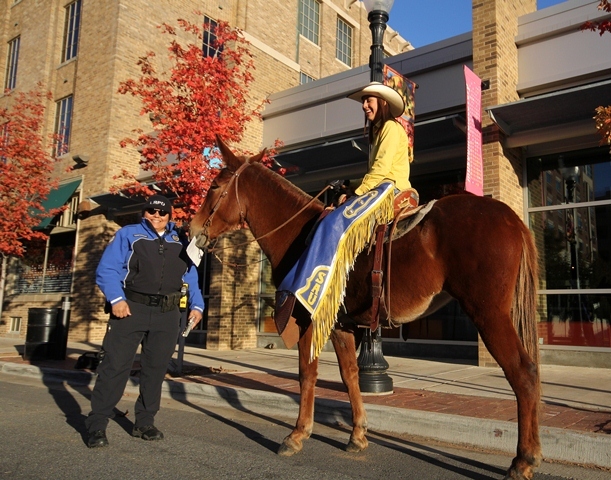 She spots the Mulerider galloping down Clinton Avenue, pulls her over and issues a ticket. Molly Ann grabs the ticket in her mouth for the cameras, which got a laugh from Griesemer and Maye. The crew was also happy to have many SAU alumni keeping up with their progress online and finding them to say hello and spy Molly. 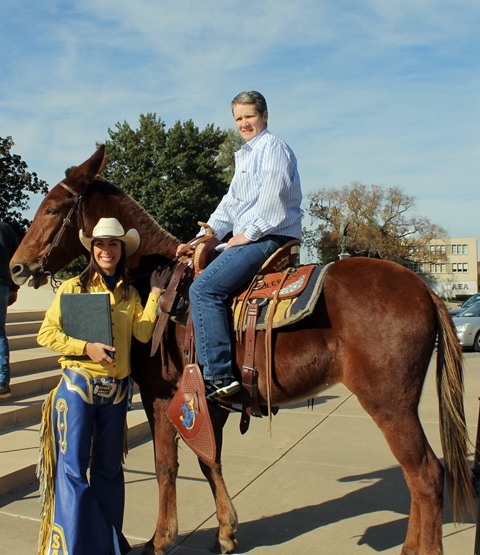 Former Mulerider Mitzi Dingler, who rode as the SAU mascot in the mid-eighties, caught up to the group at the Arkansas State Capitol. 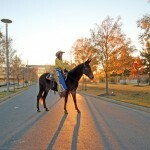 She had a chance to hop atop Molly Ann and reminisce about her years at SAU. Dingler is now a nuclear chemist at Arkansas Nuclear One. 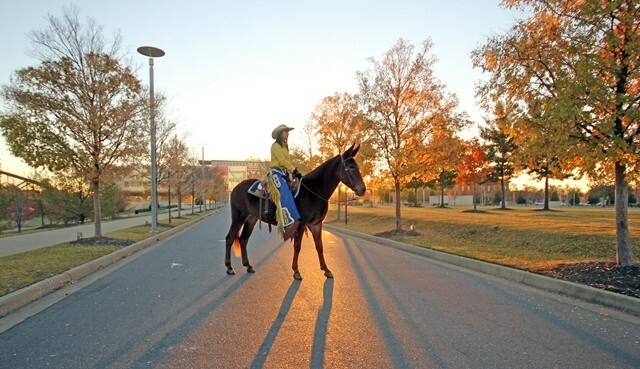 SAU was the only University south of Little Rock to have an increased enrollment this fall. 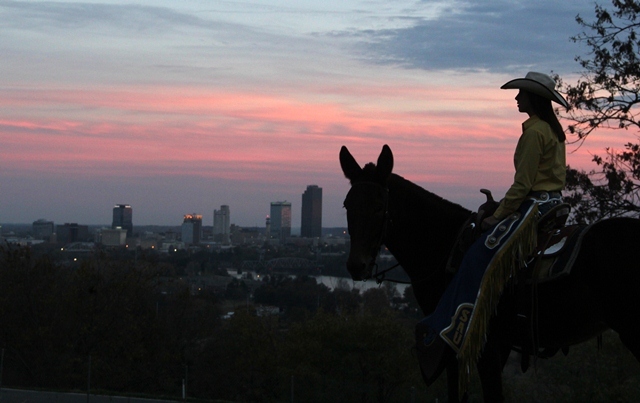 In fact, SAU attracted its highest number of beginning freshmen and had a record enrollment of 3,404 for the fall. 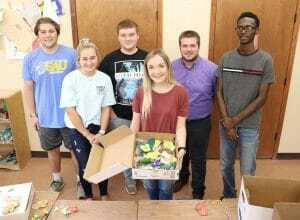 The campus’ “Complete College Experience” campaign also garnered a record number of students living on campus this fall. 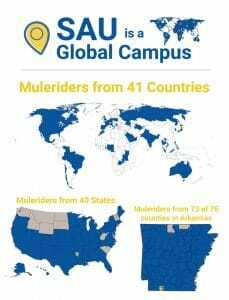 To find out more about the Mulerider’s trip or to watch the feature video online, visit the “On the Road” site.